To automate certification tests, additional setup is required. All installation and configuration steps below occur on the Windows machine running the GRL Test Harness software. Download and install the latest GRL Thread Test Harness before continuing. Install both Google Chrome and ChromeDriver. Update that new configuration file according to the instructions in the file. The Harness Automation Tool also supports mixed testbeds, where the reference devices used in each test case are a mixed set of devices rather than all the same device. For example, instead of using 32 TI CC2538 boards running OpenThread for all test cases, you could mix and match between all four Thread reference devices for each test case as desired. Download the topology configuration file from the Thread Group. Add this file as TopologyConfig.txt to C:\GRL\Thread1.1\Thread_Harness\TestScripts. This file details which reference device to use for each role in each test case. The topology configuration file provided by the Thread Group can be modified for other mixed bed configurations, but for official certification the original configuration must be used. Note: To use a mixed testbed with the Harness Automation Tool, all Thread Certification Test Cases must be present in the topology configuration file and must list all roles required for each test case. The GRL Test Harness software provides an advanced auto discovery feature (Auto DUT) which accelerates the validation process for Thread reference stack vendors. If the serial port of the DUT functions under settings of 115200 8-N-1, and the device responds correctly after every physical device reset (for example, to confirm the device's valid connection to the Windows machine), then the platform can use the OpenThread THCI tool. This tool allows the device to act as the OpenThread reference platform during testing. Note: Refer to the vendor's device-specific documentation on how to confirm a valid connection setup after device reset. Close the GRL Test Harness, if it is open. Attach the device to the Windows machine. 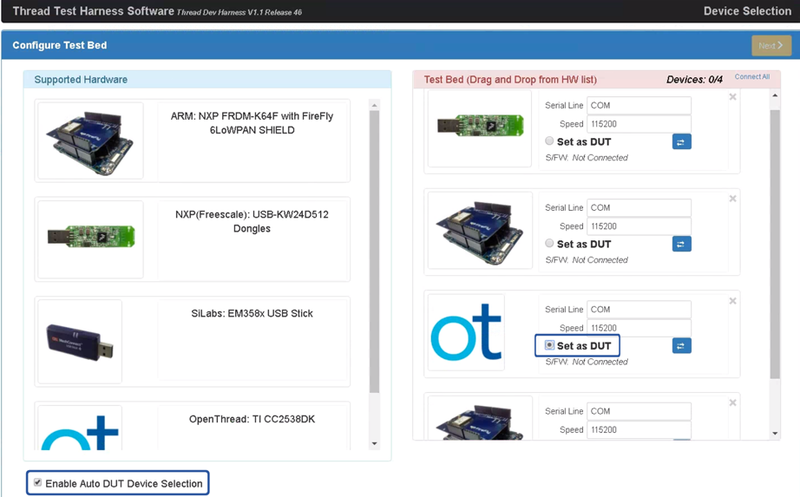 If the serial port of the DUT does not function under the proper serial port settings, or the device does not respond correctly after a physical device reset (outputs unreadable code within 3-6 seconds of reset), then OpenThread THCI can be customized to treat the device as a new platform in the Test Harness. Rename the OpenThread.py file to DA15000.py. """power down the Thread device"""
Create an icon (in png or jpg format) to make it easier to differentiate your platform and copy it to C:\GRL\Thread1.1\Web\images. Open the GRL Test Harness, the device/port now appears as a new reference device. Select the Set as DUT radio button under the target device/port to set the device as the DUT.